Hey Style Lovers, happy Friday! I don’t know about you but I’m super excited about the weekend. One of the more dominant fashion trends I noticed during NYFW were sneakers. There wasn’t one show I attended that didn’t have at least five people, including myself wearing the trend. Because I have to add a touch of chic to all my looks, I opted for a platform sneaker. 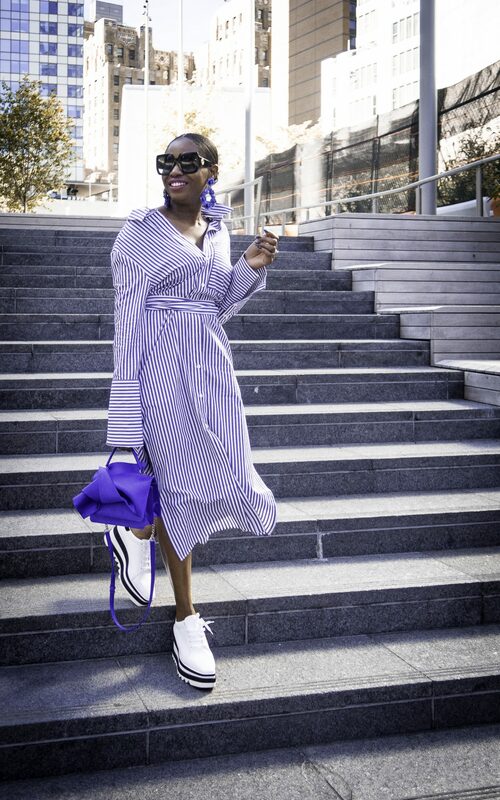 Platform sneakers might be a little hard to style for the average person, however the key to making it work is to pair it with a bottom that frames the shoe perfectly. You really want to pair these shoes with anything in the midi length. A midi skirt, dress, or crop pants tend to frame the shoe perfectly making them the ideal option to pair the shoes with. You can also pair platform sneakers with mini skirts and dresses. The shoes will elongate your legs making you look taller and longer. During fashion week, I opted for more of the midi option, creating a more casual-chic appeal. I will share my other 2 looks featuring this trend in the coming weeks, so signup for my Bloglovin news letter and never miss a post! Check out my favorite platform sneakers, shop the entire look before it sells out, and have an awesome weekend lovelies!